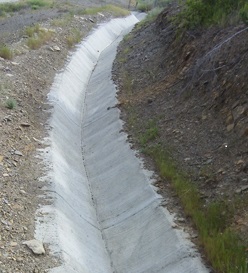 A “V-Ditch” is a concrete channel that is mostly found at the base of a hill to collect drainage before the water reaches a resident’s property. That water is then channeled to a drainage box. Water is a powerful destructive force for our roads and hillsides; ditches are the best way to safely carry water away from our infrastructure. This makes it imperative that ditches be kept clean and free of debris. Easements - What are they? Why are they important? An easement is a right that someone has over limited use of someone else’s property. Utility easements are usually given to a utility company or local government in which they use a landowners land to run utility lines, cable wires, or gain access to other land or waterways. What happens if the homeowner is not around to let the City in, in the event of an emergency or non-emergency? Property owners are responsible to provide City Officials access through the easement. Failure to do so could leave the homeowner liable for any damages that occur to surrounding properties. We ask that gates and access be left open so that in case of an emergency, the responders could easily access the easement. City crews will do everything they can to find an alternate route, but if they are unable to find a new route, San Rafael’s Police Department will assist in granting access to responders. What are the responsibilities of maintaining an easement? Maintaining an easement is a joint effort. It is the homeowner’s responsibility to keep the easement clear from clutter or vegetation and to also help monitor the easement for any potential problems. We ask that you help us help you. Who to call when there's a problem? Call the Public Works main line: 415-485-3355 or write us at www.cityofsanrafael.org/contactDPW and we’ll address your concern!